Do you often feel like you’re in firefighting mode, dealing with a constant stream of urgent issues? Or, do you feel like you’re spending too much time on the wrong tasks, so that whilst you’re getting a lot done you’re not really accomplishing anything of real significance? If either of these situations is familiar to you then the Eisenhower matrix could help. By every measure, Dwight Eisenhower was a very successful man. He was twice president of the United States. Before this, he was a five star general in the United States Army, and during the Second World War was Supreme Commander of the Allied Forces in Europe. As if this wasn’t enough he also found the time to be the first Supreme Commander of Nato and served as the President of Columbia University for a time. He was even made an Honorary Fellow of The Metropolitan Museum of Art (MoMA) for his efforts to retrieve art taken by the Nazis during World War Two. You can learn more about Eisenhower here. From this quote, the Eisenhower matrix was developed where using the tool you segment your tasks into four categories. Urgent and important: you do these tasks immediately. Important, but not urgent: you schedule these tasks for later. Urgent, but not important: you delegate these tasks if possible. Neither urgent nor important: you eliminate these tasks if possible. An Eisenhower matrix is shown below. Using the model couldn’t be easier, you simply place each of your tasks into one of the four quadrants. Let’s look at some examples of tasks that might belong to each of the different quadrants. Completing your online tax return on the day it is due. Handling an urgent request from your boss which needs to be started today. Writing a report with a tight deadline. Giving a product demonstration to a potential customer. Because these tasks are both important and urgent you need to get them done as soon as possible. One technique that can be useful to keep yourself focussed on each task is to use a Pomodoro timer. Completing an employee satisfaction survey. You’ll want to schedule these tasks into your calendar to be done later so you don’t forget them. Completing your online tax return well in advance of its due date. Meetings without an agenda or desired outcome. You should try to delegate as many of these tasks as possible, as although they need to be done they aren’t moving you towards your goals (or the organization towards its goals). Some people struggle to understand this quadrant, for example, they may argue that booking a flight is both important and urgent because if it doesn’t get done then you might lose the chance to sign an important client. A way to avoid confusion and a better way to think about this quadrant, is by asking, “Is it important that this task is done by me?”. Clearly, it may be important for you to attend the client meeting, but it isn’t important for you personally to book your flight to get to the meeting. In an office environment, pointless meetings can be a real time sink. For every meeting request you receive, don’t automatically accept the request. Instead, consider if you need to be there at all, and also whether there is someone who could go in your place. Changing your desktop background image. Although these “escape activities” are unnecessary, you may not want to eliminate them completely, for example, office gossip can be useful up to a point, and keeping abreast of current affairs may also be useful to a point. The point here is to change the way we perform these tasks so that we are more mindful when we do them. This simply means to plan them into your day rather than doing them to escape, for example, maybe you allow yourself 20 minutes each lunchtime to browse the news as you eat lunch. This is a more considered way of reading the news than random browsing throughout the day. As you can see the diagram has been color coded to make it easier to understand the importance of each task. 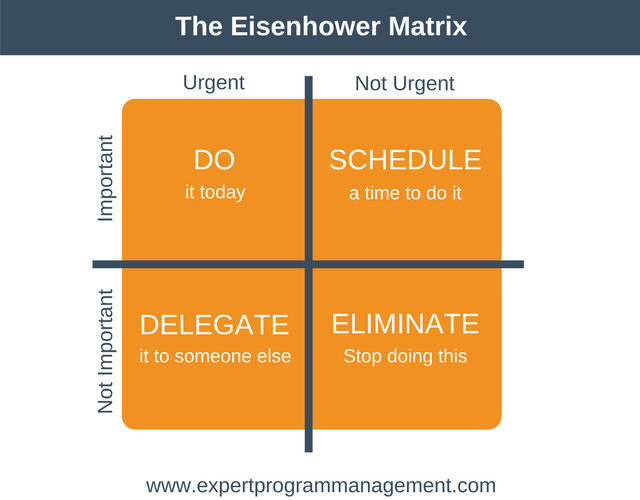 Even though the Eisenhower matrix can help us prioritize our tasks it isn’t foolproof. If you don’t have defined goals then it becomes really difficult to determine if something is important or not. So, if you’ve been trying to implement the Eisenhower matrix but failing then you may need to revisit your goals. Read More: in our guild to goal setting. 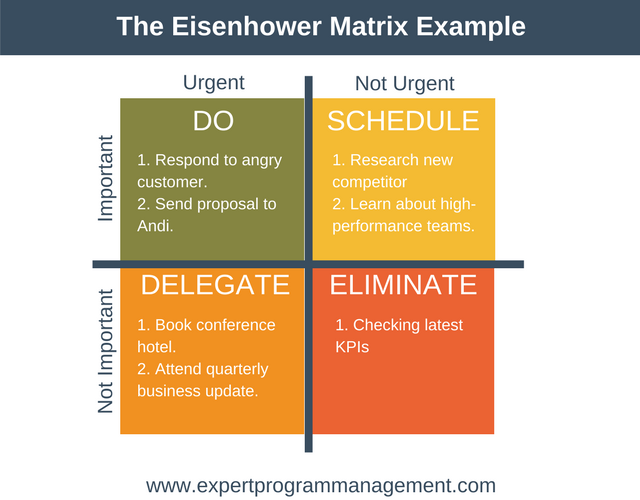 The Eisenhower matrix is a simple tool which can help us to be more productive. It does this by categorizing our tasks into one of four categories: do immediately, plan for later, delegate to someone else, and stop doing.